It's a sight that has absolutely floored the top scientists in the world. 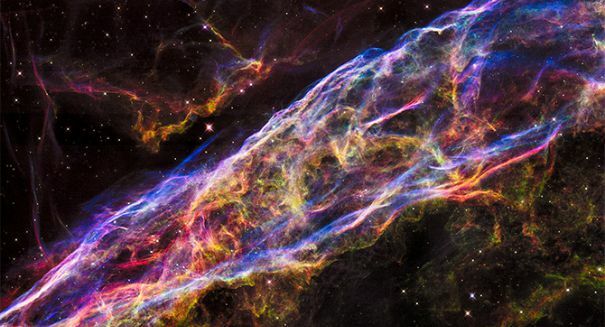 NASA’s Hubble telescope has just captured new images of the Veil Nebula that are absolutely jaw-dropping. Featuring long tendrils of plasma that are the remnants of a massive star the burst about 8,000 years ago and turned into a supernova, the Veil Nebula is now a spectacular sight for astronomers that was glimpsed by Hubble recently, according to a Discovery News report. The picture above is just a zoomed in section of this massive supernova, which is incredibly violent event that happens when a star collapses and explodes, sending a huge amount of energy into space. The Veil Nebula may be the best known supernova that is visible, with its huge wispy strands of hot plasma that stretch a full 110 light years across. It is situated in the constellation Cygnus, about 2,100 light years away from us. It took six images stitched together to create the full picture, but it only spans two light years. But that allows the viewer to see this long, strand-like nebula in greater detail. The brightest strands that you see are a result of the shock wave from the supernova that is hurtling through interstellar space. It’s a bubble that is expanding into a region of cool interstellar gas, and the leading edge shows a range of vivid colors. These colors are a result of the shock wave interacting with the cavity gas, causing a huge heating effect. So what do the different colors mean? Red comes from hydrogen, while you can identify the sulfur by the green colors. Meanwhile, the blue is oxygen. The diffuse glow is from the cooler gases that were heated up by the traveling shock wave. It’s not just a beautiful image — it’s an image of tremendous importance to scientists. Hubble first spotted these images in 1997. Now, astronomers are comparing those images with today’s to see how it has changed in the last two decades to uncover anything new about the dynamics of the nebula that was formed by this massive explosion. The Veil Nebula is more specifically a cloud of heated and ionized gas and dust. The source supernova exploded up to 8,000 years ago but could have happened as recently as 5,000 years ago. Since then, the remnants have expanded greatly, covering an area that is about 3 degrees in diameter, which is about six times that of a full moon in the night sky. The Veil Nebula was first discovered long before Hubble first glimpsed it. In fact, it was William Herschel who first discovered it back in 1784. Despite have a pretty bright integrated magnitude of 7, the nebula is spread over such a large area that many astronomers have difficulty seeing it at all. Some have to use a telescope with a special filter, which makes it immediately visible. In the x-ray sky, it is one of the brightest features out there. A nebula, which is Latin for “cloud,” is a interstellar mass of dust and ionized gases that comes from the collapse and explosion of a massive star. Originally, astronomers simply named all astronomical objects nebula, even the Andromeda Galaxy, before scientists came to a greater understanding of the differences between these cosmic objects. Nebulae are typically huge in size, spanning hundreds of light years in diameter. Nebula are regions where stars are formed, such as the famous “Pillars of Creation” in the Eagle Nebula. In these places, the formations of gas and dust begin to clump together to form larger masses, which continue to attract matter and can become massive enough to become stars themselves. The rest of the materials then form into planets or other objects. The first description of a nebula is believed to have been about 150 A.D., when Ptolemy recorded in Almagest five stars that appeared to be nebulous in appearance. We can thank NASA’s Hubble space telescope that we can have such clear glimpses of these spectacular astronomical phenomena. Hubble was first launched in to low Earth orbit back in 1990, where it continues to operate to this day. It has completely changed the face of science, at least as far as the public’s perception of it. It has allowed NASA to display some spectacular images of deep space to the public and spearheaded some important scientific discoveries, peering so deep into space it can see galaxies billions of light years away, back when our universe was merely an infant. The telescope has an 8-foot mirror with four main instruments that allow it to observe space in the ultraviolet, visible, and near infrared spectra. It was named after the astronomer Edwin Hubble. Because Hubble circles the Earth outside of the Earth’s atmosphere, it can take extremely high-resolution images without any background light. As a result, it can take visible-light images more detailed than any that has ever been seen before. Its observations have been so important, it has resulted in a breakthroughs in astrophysics, as well as determining the true rate of expansion of the universe.